After many rumours and speculations, Samsung Galaxy 5 is finally a reality and has been officially announced. 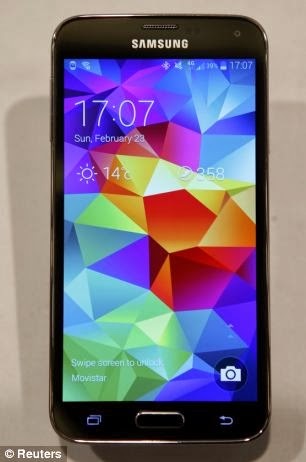 The Samsung's 2014 flagship smartphone was unveiled at Mobile World Congress in Barcelona along with Gear Fit - a wearable fitness device. It has a 5.25-inch screen, 16MP camera and runs Android KitKat 4.4. Samsung claims it crams in a professional camera and a powerful fitness tracker while being water and dust proof - and comes with fingerprint sensor technology, just like arch rival the iPhone 5S. Like Apple's iPhone 5S, Samsung's latest handset has a Fingerprint Scanner, providing a secure, biometric screen locking feature.